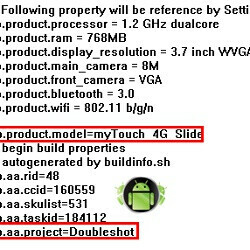 T-Mobile myTouch 4G Slide may be the name of the HTC Doubleshot, a 3D handset? Ever since the good lads at 911 Sniper leaked the HTC Doubleshot's ROM, a lot of people have been hard at work to dig deep in it. The result is that we have pretty much all the relevant specs about this handset, as well as what may end up being the launch name of the handset. We got some insight about this phone's specs thanks to its user agent file, but now a lot of details are cleared up. Moreover, it's indicated that the phone internally known as the HTC Doubleshot is set to be released as the T-Mobile myTouch 4G Slide. HSDPA 14.4Mbps and HSUPA 5.75Mbps support. We don't know about you, but these are all-around great specs in our book. Even better, it's claimed that the HTC Doubleshot has a lot to offer software-wise, as it's expected to pack Gingerbread and HTC Sense 3.0. It's rumored that this handset will be launched in July by T-Mobile. YEP. THAT'S MY NEXT PHONE ALRIGHT. :D got the physical qwerty, front facer, and dual core. i'm a TOTALLY happy camper if those are all on board. let's just hope it doesn't hurt the wallet too bad..